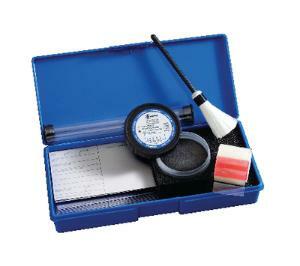 The kit includes a Zephyr® fiberglass brush, 2 oz. jar of bi-chromatic fingerprint powder, one 1 1/2" x 360" roll of lifting tape, and 100 white 3" x 5" backing cards. Everything comes packed in a sturdy polypropylene carrying case with a custom foam insert. Size: 10 3/8"L x 4 5/8"W x 1 3/4"H.